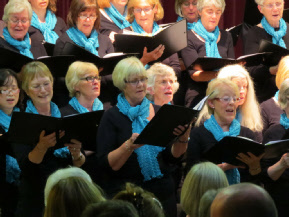 Jazz was the theme of the music sung at the Twyford Singers Concert on Saturday 28th June. 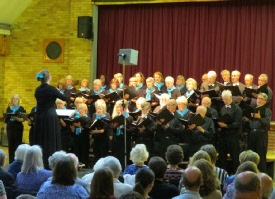 The piece around which the summer concert evolved was Bob Chilcott's Little Jazz Mass and for this, the choir was accompanied by piano, drums and double bass. The programme put the Jazz Mass into its musical context: commencing with traditional spirituals and followed by some jazz standards. The first half of began and ended with a selection of spirituals, ¯X ¯X with the audience being invited to join in with the singing and also the movement. The audience participated with great gusto and enthusiasm ¯X. The spirituals were interspersed by the Little Jazz Mass. This is a very difficult piece but was tackled very well by the choir with the final result being a delight to listen to. ¯X. The rhythms and syncopation made this a fascinating piece. The jazz mass was a style unlike any the choir has attempted in the past, and it was a great success. The first half concluded with two more spitituals ¯X. The second half of the programme was a selection of very well know pieces including ' I got rhythm', 'Blue Moon', Hallelujah and 'Ain't misbehavin'. The concert finished with a couple of Beatles numbers and Cole Porter's 'Every time we say goodbye'. Soloists from within the choir sang in both first and second halves (Judy, Sue, Marjorie, Danny). There were many compliments from the audience on how well we sang.